Please read the title in a sing-song voice 'cos that's how it sounds in my head! 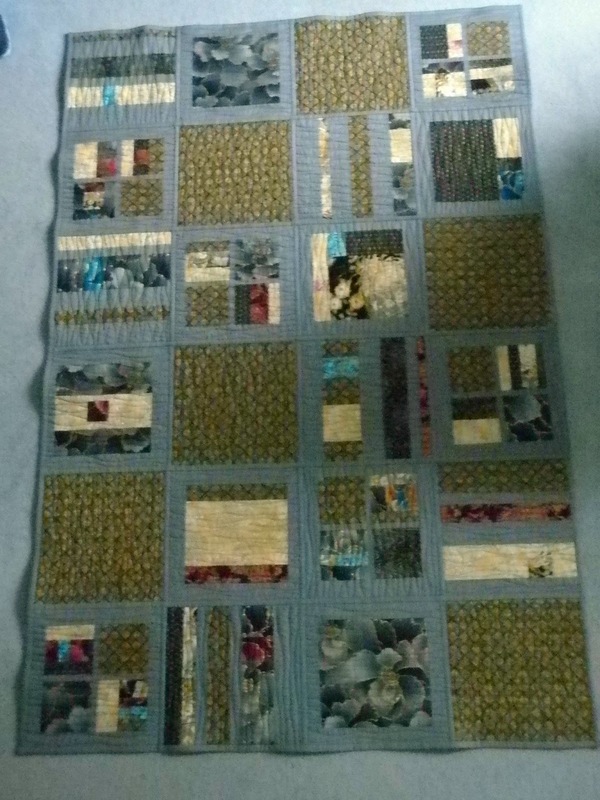 Last night I (finally) put the final stitch in the binding of my Stained QAL quilt. I got up this morning to take some (really bad) photos before putting it in the washer. 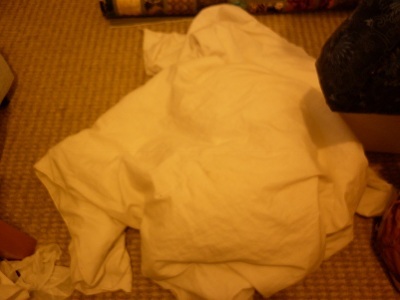 I then went back to bed to read doze until the washer played its tune and I got up to put it in the drier. My apologies for the bad 'before washing' photos (and, now I've uploaded the 'after washing' photos, I can see that they're no better!) - I waited until it was as light as it was going to get (it's been one of those 'lights on from 9am onwards' days) but they're not brilliant mild understatement and the colours look so washed out compared to real life. Even faffing on Picmonkey didn't help but I wanted to get my 'ta da!' post in before the year was out so I haven't got time to wait for the sun to shine! I really need to find a better place in my house/garden to take photos - how do the rest of you manage?! These were taken in my front room, with me hanging over the banister, holding the camera out at arm's length and hoping for the best. Which didn't happen! 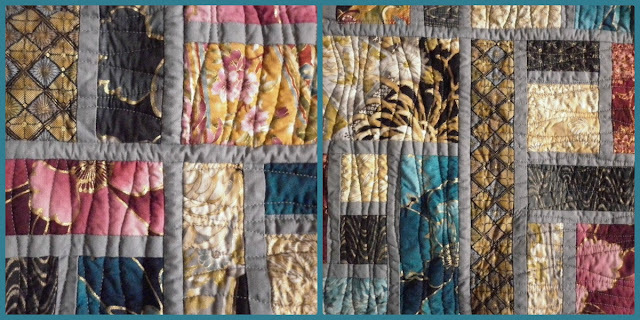 And a close-up of the quilting and some of the slightly dodgy intersections, which aren't as evident in this photo as I thought they'd be but I've probably got my picky knickers on when I look at the quilt! Beautifully wrinkled and crinkled...and not quite dry! The colours are much more like they are in real life though! It's not the flattest quilt I've ever made but neither are people and it's intended to be a snuggling quilt. 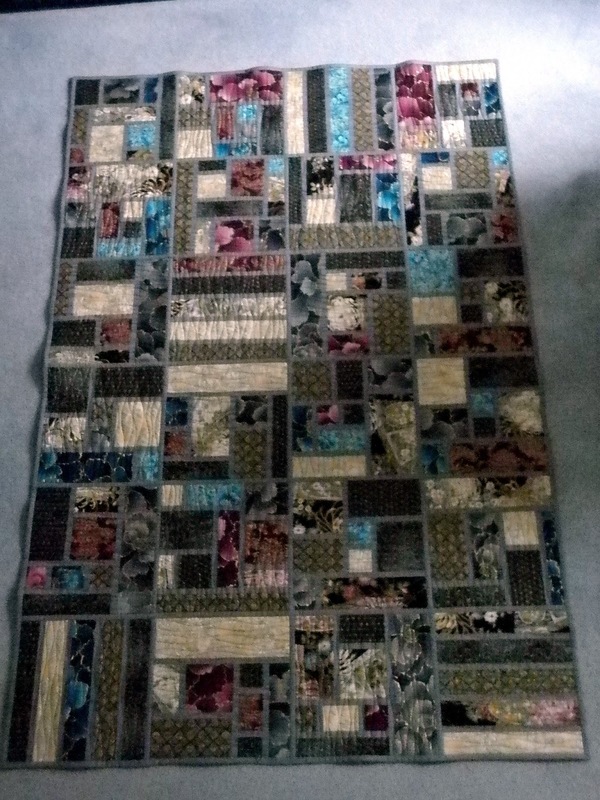 I also think that being squashed in the drier hasn't done it any favours and, after a couple of hours in the airing cupboard, it's looking distinctly less bumpy but you'll have to take my word for it as there's not enough light to take a photo! I don't usually name my quilts (other than 'the blue and white one', 'the big one', etc.) but I feel this needs a name. As it's made from the leftovers of this quilt (also made for Mam and Dad) and given that at this time of year we're all eating leftovers, I wondered about calling it 'Turkey Sandwiches' but I can't see my parents going for that so I suspect it's doomed to being called 'Leftovers' for the foreseeable future...if you have any better ideas please shout! Pattern - based on a design by Sarah@Narcoleptic In A Cupboard (see the Stained QAL Flickr group for details) and adapted to make the best use of the assortment of odd-sized leftovers I had available. 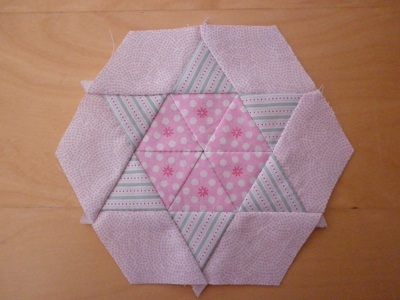 Thanks, Sarah, for hosting a marvellous QAL, I really enjoyed it, even if I'm almost (but not quite, Annabella!) last! That's about it from me for this year...thank you for all your support, kindness and thoughtful generosity this year, I think you're all marvellous! 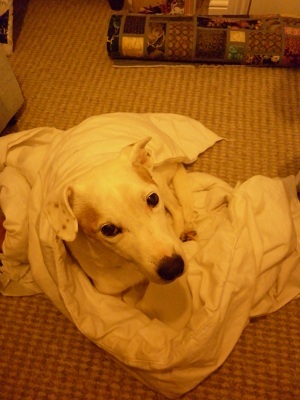 It wouldn't be an ATWD post without a photo (or eight) of his Lordship though, would it?! Are you sure this isn't for me? Happy New Year - I hope 2013 brings us all good health, peace, happiness and lots of stitching time! 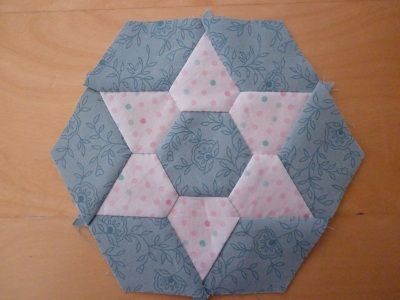 On December 13th, exactly sixteen months after I pieced the first hexagon, I pieced the final hexy for my quilt! 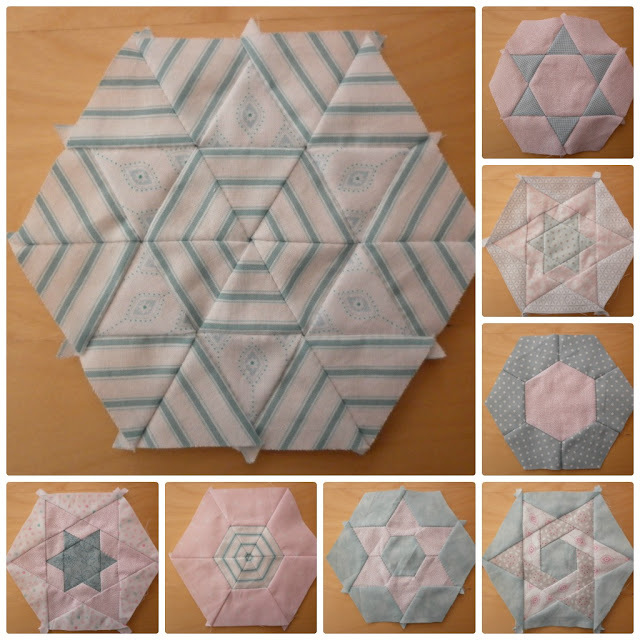 Hexy 191 - the striped fabric is a dream to work with! Hexy 192 - a final fairy! 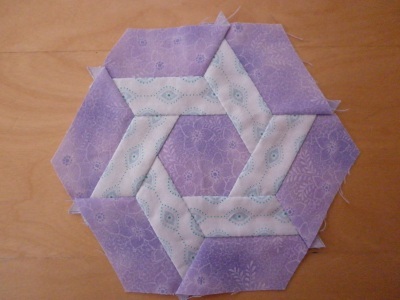 Hexy 194 - I have ironed it, honest! Hexy 195 - the final one! A lovely basket and lots of goodies from Jan, who didn't want me to be left out of the Secret Santa fun! 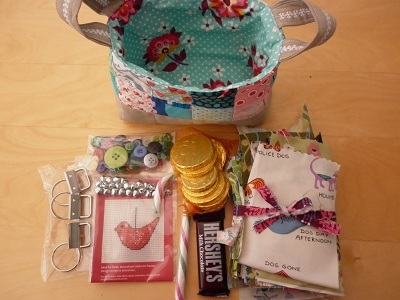 A fabulous travel sewing pouch (and charm packs and chocolate!) from Jude. The most wonderful book from the delightful Salley - she even got it signed for me by the author!! Thank you, all of you. 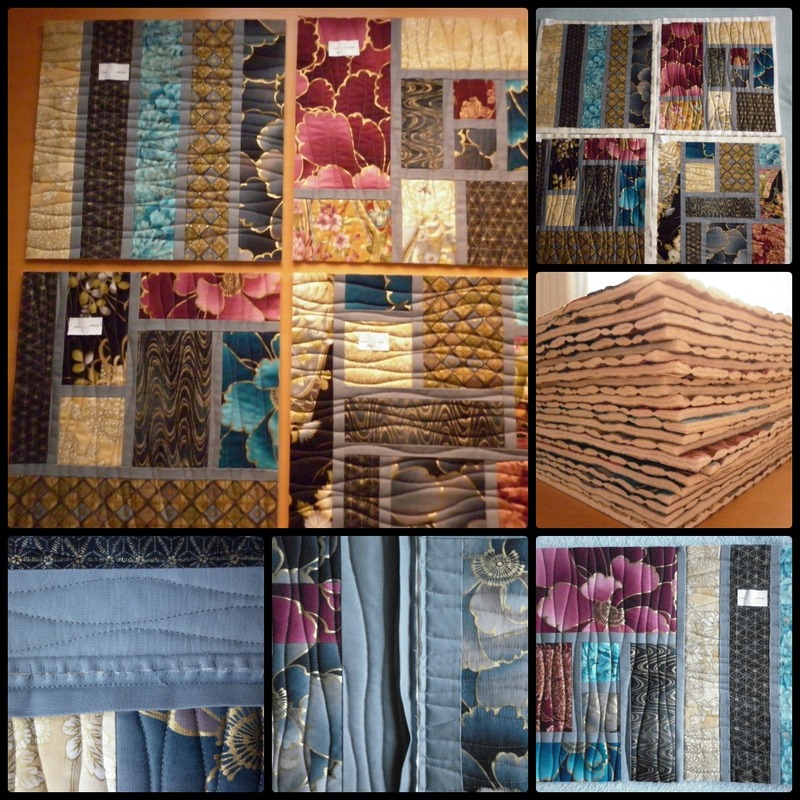 I really appreciate your thoughtfulness and treasure the generosity of our quilting community. Is that him? Alfie, what do you think? Is it? 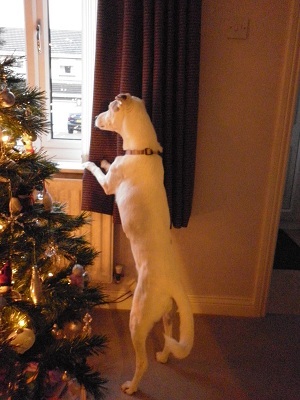 I'm sure I can hear sleigh bells...he hasn't forgotten me after all! Definitely sleigh bells! Which way does he come in? Front door or back? I need to know! 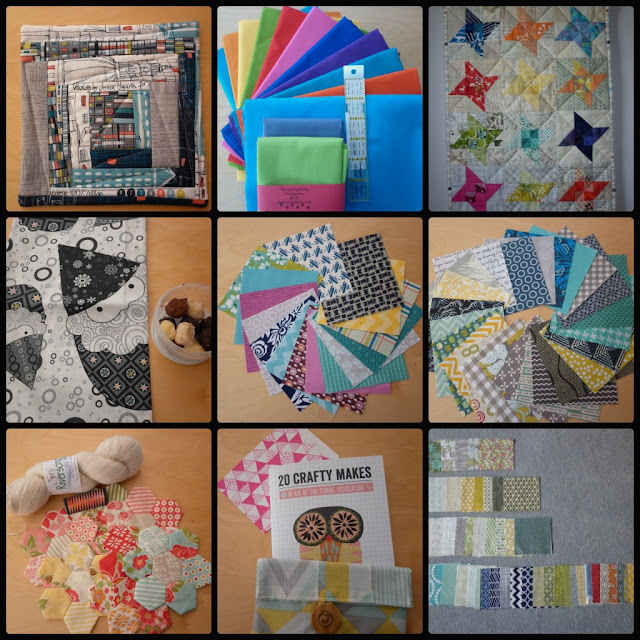 I hope you all had a lovely Christmas and found some sewing time to salvage your sanity. Now, if you'll excuse me, I've got the binding to stitch down on the back of my Stained QAL quilt (really need to find a name for it!) and then I'm done! I'm hoping to have it finished (and washed, dried and photographed) by the end of the year, which means I need to get a wriggle on! 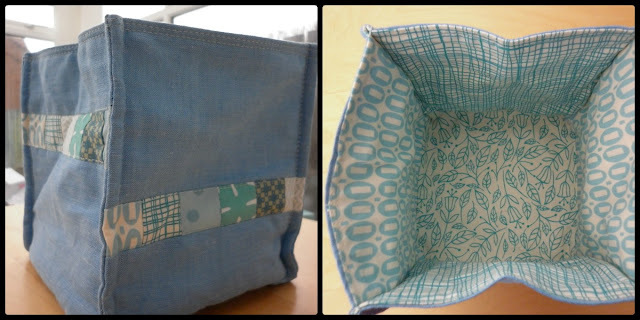 Happy stitching and, if I don't make my deadline, Happy New Year! P.S. Sorry I haven't managed to reply to all the comments on my last post, I haven't really been on the computer for the past week so I'm way behind! I'll work my way through though, it may just take a few days! Catching up and a finish...albeit a small one! Yes, you read that right! A finish! 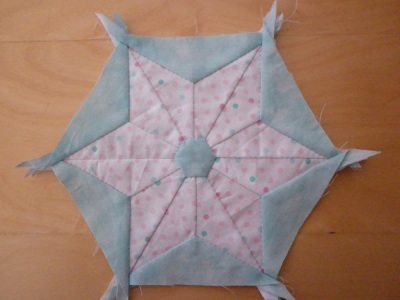 (Other than several thread catchers and a few pin cushions I think this is the only thing I've finished this year!) 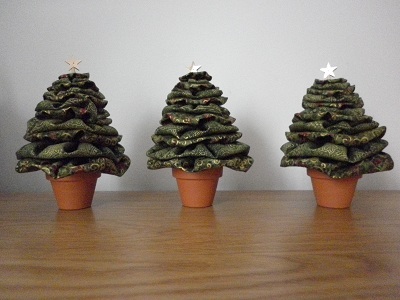 Last year I made my mam three little trees to go on her dining table and we decided they would look better if they were on a plainer runner than what she was using. So, in typical style, I planned the runner and collected the fabrics and then...did nothing. For eleven and a half months. 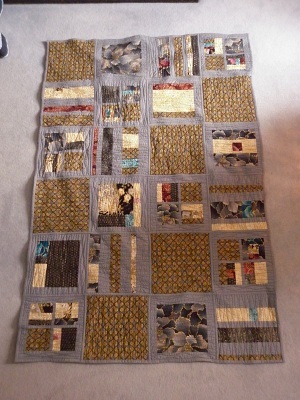 I finally pulled my finger out, though, and started (and finished) it this week. It's very simple because it's there to show off the trees not shout for attention. It looks nice with or without trees and I think is subtle enough to be used throughout the year but glittery enough for Christmas. 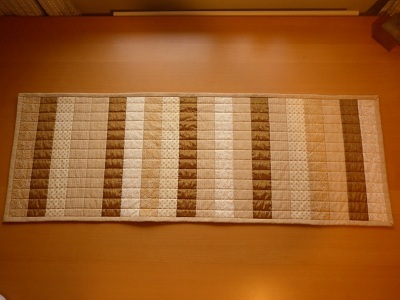 Simple strips (2" finished) of a variety of cream and gold fabrics. 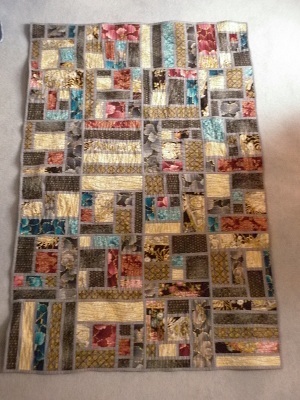 I made it in a 'flip and stitch' style and then added extra quilting lines in a metallic gold thread. 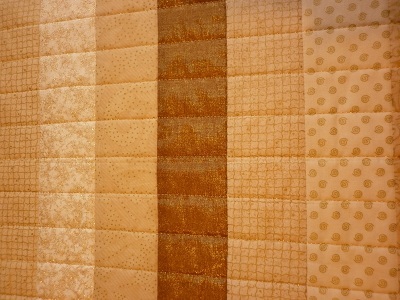 The fabric second from the left in the above photo is cream with gold glitter...it looks fabulous in person, if I do say so myself! 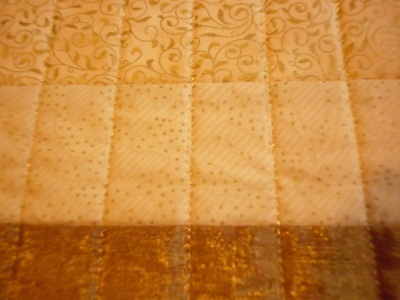 A slightly better photo of the gold quilting stitches. One of the fabrics I used was a shot fabric - the warp is metallic gold and the weft is bronze (or it could be the other way round!). It's got a nylon content of 20% but is a quilting weight (and good quality) fabric and adds a bit of sparkle to the runner. Not that you'd know by these photos! All these fabrics are the scraps remaining after I made Mam's red, gold and cream quilt, I bought the binding and backing fabric in a sale last January and the wadding was left after trimming a quilt so I think the whole thing cost about £5 - bargain! 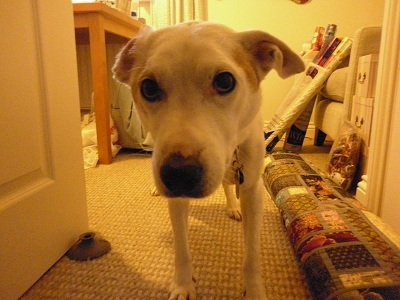 I haven't really done much as I've been poorly for a couple of weeks (I had, or was developing, a quinsy - very painful!) but in the last few days I've felt much better. Still shattered but at least I can swallow. And eat! The cookies were delicious! I got the recipe from Kerry after I saw a photo on Twitter - I think she got it from here. I made a double batch and used dark brown soft sugar (I didn't have any light brown) and I'll definitely be making them again! Rice Krispies aren't something I usually have in my cupboards so I bought a couple of the small single serving boxes (the ones that always remind me of a B&B!) - I'll keep an eye out for them being on offer in the supermarket as they worked perfectly. 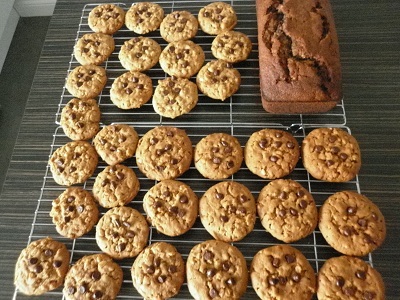 The banana bread is a Nigella recipe cut out of a magazine and looks lovely. Unfortunately, it smells like the back of a chip shop (oily!) and has virtually no taste. Lovely texture though and it lasts for days. Even when you keep the lid off in an attempt to get it to harden in order to put it out for the birds! Not one I shall be making again, I'll stick to my usual recipe from now on! 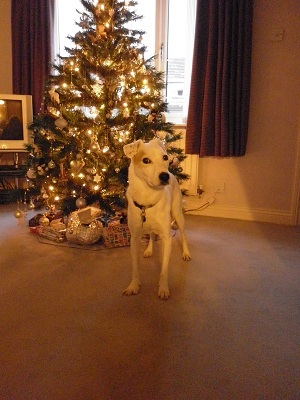 I've also managed to put up and decorate the tree (Wednesday) and this afternoon I finished wrapping presents...phew! And it's that time of year again. Christmas bath time. 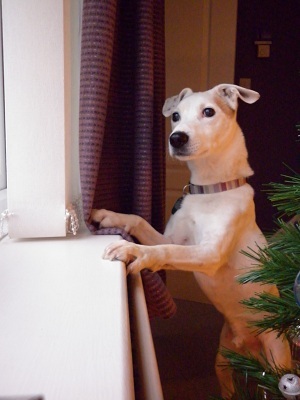 Last year I bathed his Lordship outside (with buckets of warm water) but I couldn't bear to do that again so, for the first time ever (at least in the eleven years he's lived with me), Archie went to the dog parlour! I thought he'd be a nightmare for them (he's petrified of water. And hair dryers.) but he was a model client - I know because they took video footage and photos so they could show me! He also went in the 'drying cupboard' and slept for twenty minutes and then stood on the table while they brushed him and trimmed his nails. And my, does he look handsome and smell wonderful! And his head is so soft! Want to see? I feel pretty! Oh, so pretty! I feel pretty and witty and bright! And I pity, any dog who isn't me tonight. That's better! I love you. 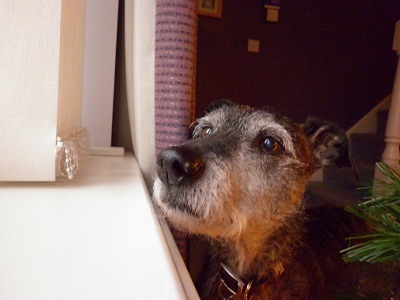 Have you got any biscuits up there? 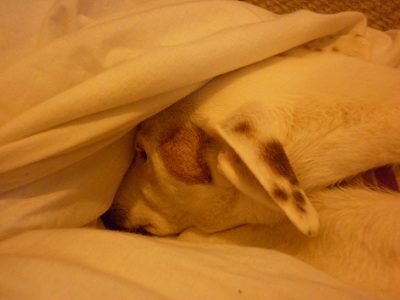 Yes, there really is a dog under there - look! 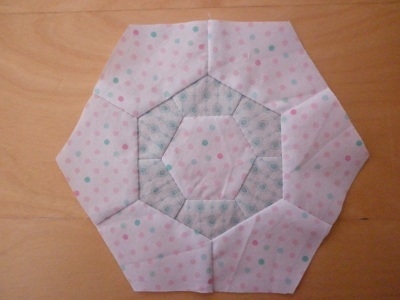 * A gorgeous mini quilt/mug rug from Sheila - made with scraps of Velocity. 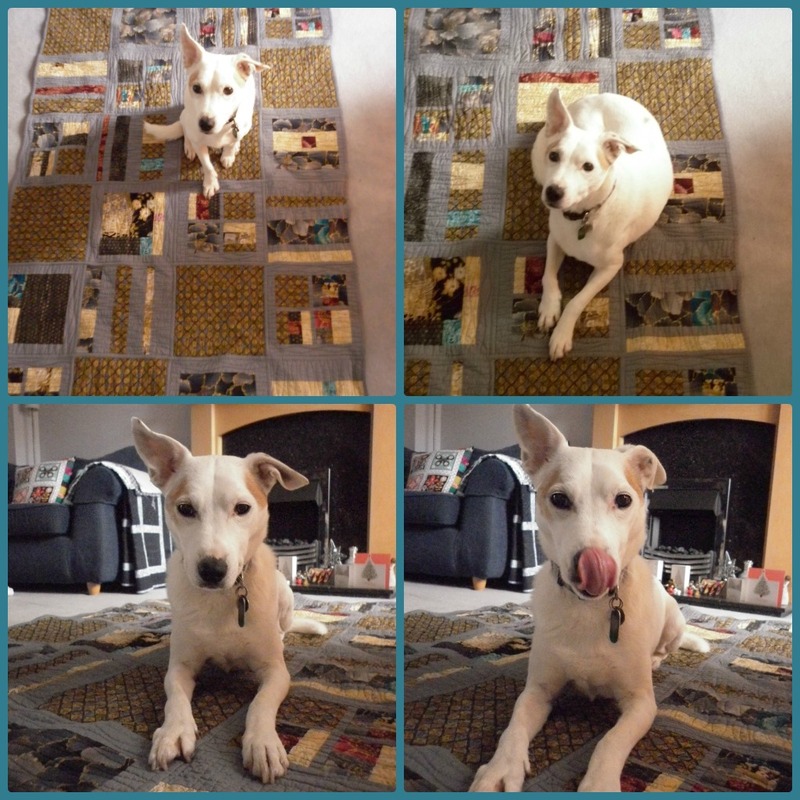 Have you seen her magnificent strippy quilt? 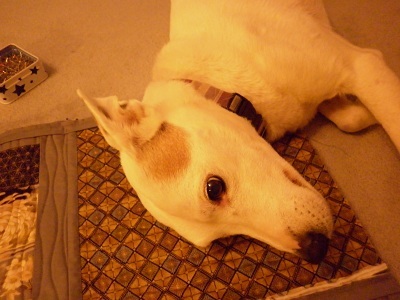 * I spent the voucher I won in the draw which formed part of the 'Pets on Quilts' contest in August. I got half yard cuts of a variety of Kona solids (for my Summersville quilt...more on that another time), a fat quarter of Kona something (slate? ), a fat quarter of a green RJR solid (to compare to Kona - it feels lovely but I haven't used it yet) and (yet another) little ruler. I love these rulers, they're so handy - I think this may be number four! All from The Quilted Kitty - thank you!! 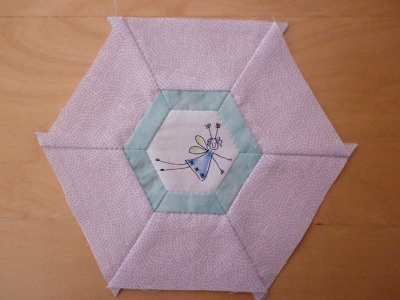 * A wonderful (and surprise) friendship mini from the Bee a Brit Stingy bees. Read more about it on Sheila's blog - here. *A yard of Winterkist gnomas (I was lucky enough to win a giveaway!) and some (scrumptious) chocolate truffles from Nic. * Part of a custom charm pack from Nicky. She makes these up for me every now and again - isn't she a treasure? * The rest of the charm pack! * Some pretty hexagons and lace weight yarn from Leanne who decided the fabric wasn't really her and kindly sent it to me. I love it! 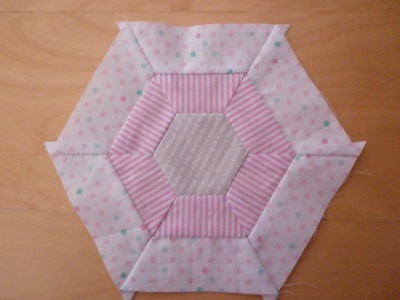 I've already started to piece a cushion from the hexies and the yarn is so, so soft - I can't stop cuddling it! * A copy of '20 craft makes', which is being sold in aid of The Stroke Association and features Karen@Blueberry Park - she also sent me a pouch, made using her project in the book and it's the perfect size for my crochet hooks! 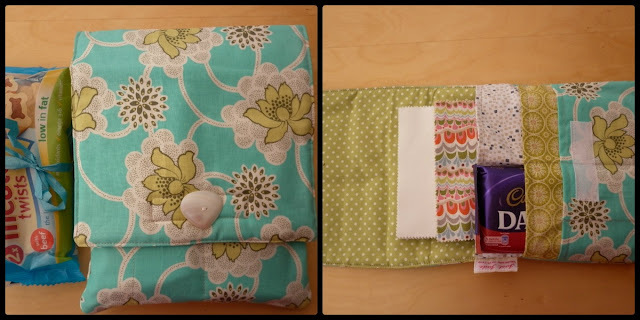 * Another custom charm pack from Nicky - she wanted to see which fabrics I liked best so I arranged them in order of preference. 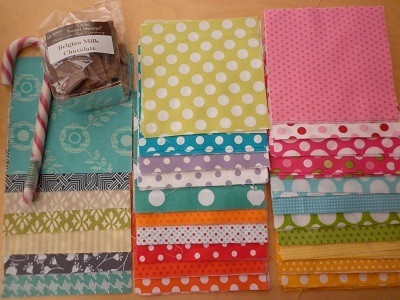 The bottom row are my favourites, with the far left fabric being my top choice and working down from there. Or rather, working along and up from there! Thank you, all of you - I really appreciate your kindness, even if it does take me weeks to blog about it! P.P.S. That seems like a sad note to end on so here's a(nother) cute photo of Archie, taken when I was attempting to pin two rows of QAYG blocks together. To be fair to him I was in 'play position'* so I suppose it's understandable! * On all fours, a#se in the air! Forget pinning...I need a fuss! 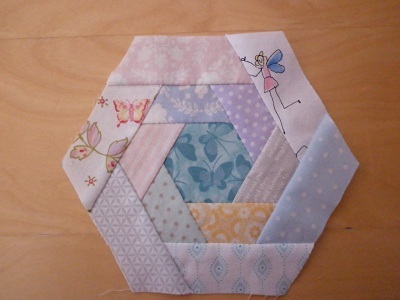 All but one of my November hexies - there wasn't room for the other one! I've now got four hexies left to piece (and another four that are pieced but haven't been shared) and then I'll have 195 hexies, seventeen of which are 'whole' (i.e. 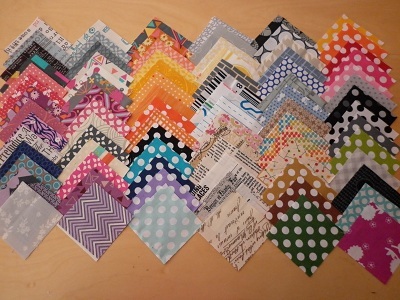 unpieced) and the remaining 178 are pieced. 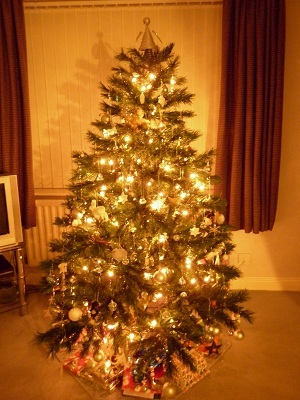 I've also (finally) kept my promise and have sorted out a tutorial for the Suffolk puff Christmas trees I made last year. My friend very kindly gave me permission to use her templates and instructions to make a mini tutorial instruction sheet. I've created a Google document with the instructions and the templates (it took far longer than anticipated to get the templates to print out at the right size!) and you'll find it here (I hope!). I haven't taken any photos of the steps as, to be honest, it's really very simple and I didn't feel there was a need. If you get stuck on any steps (or find any mistakes!) then please shout and I'll do my best to help! Archie is much perkier than he was last week and is thoroughly enjoying his walks! He's down to one Tramadol a day (in the morning) and is being allowed off the lead for a little bit further every day, much to his delight! To celebrate feeling brighter he was allowed a chewstick. You I don't want to think about what they're made from but he loves them! I hope that next time I post it'll either be about the final hexies or a grand reveal of the Stained quilt but don't hold me to that! 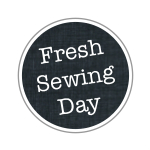 I've linked up to Lynne@Lily's Quilts for Fresh Sewing Day, why not pop over and see what everyone else has been up to?